Through my initial introduction to the etchings of Samuel Palmer (1805-1881), I gradually came to appreciate the work of other members of the Ancients as well as the visionary influence that William Blake had on the group. The circle was made up of George Richmond, Edward Calvert, Welby Sherman, Francis Oliver Finch, Henry Walter, Frederick Tatham, Arthur Tatham and John Giles. The artist John Linnell Samuel Palmer’s Father in law was also a familiar figure. As early as 1824 Palmer visited Shoreham. His family eventually moved there with in 1826. Other members of the group visited for short or extended periods. 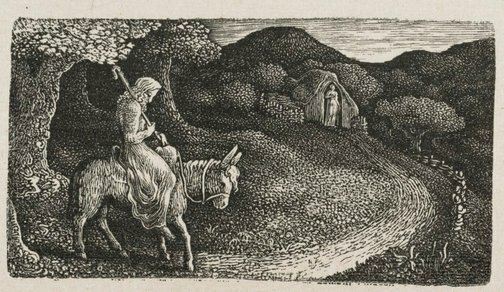 George Richmond and Edward Calvert visited Palmer in Shoreham on numerous occasions and produced both paintings and engravings of exceptional quality. 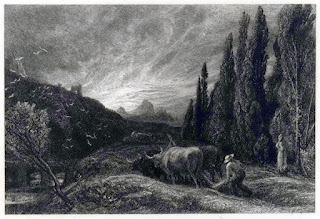 Later in life palmer made a small group of etchings which are reminiscent of the work he began in Shoreham in his youth. Blake journeyed down with the Calverts into Kent in the roomy carrier's van of antique shape, drawn by eight or ten horses with hoops and bells, which started at Charing Cross and deposited them at Shoreham on its way to Tunbridge Wells. 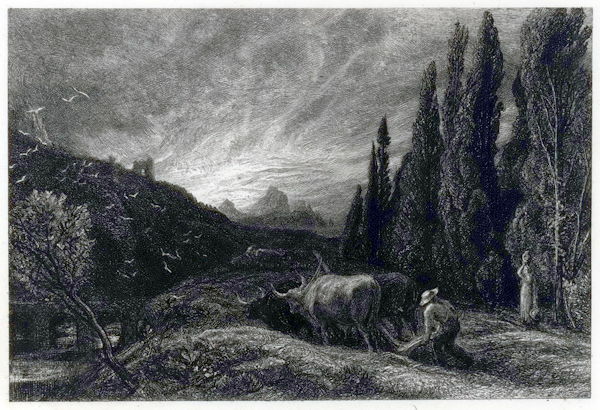 It was Blakes last visit to the country, in the last years of his life, probably in the autumn of 1826; and we can imagine him happy in this patriachal mode of travel through the pleasant fields of Kent and happily seated in the chimney-corner on arrival, opposite the elder Palmer, the old book seller, who shared his son's retreat with his youthful friends around him. Eventually Palmer left Shoreham returning to london in 1835.